I wrote two long threads on how to deal with harassment, hate speech and trolling in social media on the Curaters of Sweden twitter account. One for individual accounts and one for organizations. Then I promised to post it here so here goes! This is a mostly unedited version, just a bit cleaned up. I’ve worked with information and customer service, as a press secretary in public sector and NGO communications officer. I’ve worked with people and with the interwebz and I have personally and privately been working against online harassment, hate speech and trolling for years. So yes, this might be my opinion, but it is a professional one based on years experience dealing with people who not always act kindly or with respect. I used to advocate dialogue, but in recent years I’ve changed my stance. There is a time and place for dialogue, but it is not always social media. My stance nowadays is the more pragmatic: Choose your battles. But also choose your opponents. Meaning: If someone is spewing vile comments to you, you do not owe them answers. And if that someone is an anonymous account with hate or troll symbols, chances are they’re not at all interested in dialogue. I also believe that you are well within your right to say “heck no I’m out” when the topic of discussion or hate is your very existence. For instance, if someone spews sexist or racist remarks at me I will not engage. I will not discuss my human rights for my rights are non negotiable. However if someone is being bigoted in some other way that is not personally connected to me, I will when possible defend others human rights. Why not engage? Personal safety. Taxing on mental health to argue with one targeting my VERY BEING + can be dangerous bcz of targeted threats. Why yes when it’s about other bigotry? Simple. Solidarity. My friends will come through for me, so I come through for them. Now I know some like to discuss and if that is your thing than you do you. But it is ok to not to. And it is ok to block. For me, and for many others, the block button has become the very best tool online. It frees up time for so much more. Because here’s the thing. The group spewing hate speech, bigotry and harassment is a hydra. Slay one head and two new pop up. Don’t be fooled by the account’s that they got, they’re still trolls from the block. With MULTIPLE accounts. One person might have one official account and then a couple of accounts for hate follows and secret creeping and print screening. The thing about trolling is that it is meant to take up maximum of your time and energy and minimum of theirs. Why give your time away like that? They don’t want dialogue. At best they just want to throw their bigotry into your mentions, at worst they want to hate and harass. So how do you combat a hydra? You have to get to the heart of it to block it off efficiently. That means starting a blocks with big extremist accounts (nazi, racist, sexist, LGBTI-hating etc etc), and onto to their followers and so on. It could also unfortunately mean accounts that themselves don’t engage in hate but have a lot of followers that do. So when specific accounts retweet you and you get a hoard of hate which they themselves don’t take action against you might have to. You can also klick on hashtags on racist, sexist, gay bashing, trans hating, etc and so on topics and block the worst from there. And then, share your blocks! Chances are, if you get targeted, someone else like you might be next. Why not spare them this. But why should you block? As I said to choose your battles. To not focus on the ones who hate you, but the ones who might actually listen to you. In 2014 Freedom House pointed to how women and LGBTI rights are undermined by digital threats and harassment. And it’s not gotten better, now also civil rights advocates and anti racists. Effect is self-censorship and inhibits participation in online culture. That is the foremost reason why I nowadays advocate block and report to social media and/or police for hate. Think of what we can do with our time if we don’t have to battle the hydra! Remember: What is your goal, what is your focus? If you work with a cause or in an organisation, what do you want to achieve? Let’s say you work at a women’s shelter. You want financial support and you want more volunteers. You think the hateful groups @:ing you will help with that? No. But I and people like me might. So what is worth your time, what gets a better effect? Battle with the hydra or dialogue with the undecided? That’s what changed my mind from trying to talk people out of hating me and the fact that I am an immigrant or that I am a woman. I started working in project educating youth about social media (See here, but note they’re working on site right now: http://www.nataktivisterna.se/ ) And BAM it hit me. I realized the hate-tweeters might be loud but they are actually not as many as they want it to seem. I met these amazing people involved with human rights causes, and young people who wanted to make a difference. I met the answer. Because, while they might be waging wars on the web, lots of others are doing good work both online and offline. And that my dears is what is going to make the difference. Us working together. Us talking to eachother, country and world wide. I just leave that giant hydra in the corner where it belongs not giving it my time, fuel or energy. Now, I bet someone wants to or already has said something about “freedom of speach”. Freedom of speech does not equal compulsion to listen. The right to express opinion doesn’t make it mandatory to read it. Now, for organizations! This one is a bit more complicated, and that’s why I usually hold 1 h 30 min presentations about it. But I’ll try for a short version. First off, forget the old saying “The customer is always right” because what if they’re not even customers to begin with? What if the persons posting are not customers, members, readers, voters or even remotely interested in you in any way other than this attack? Remember what your focus is as an organization. Who is your target audience? What do you want to achieve? There will be groups campaigning against you if you want to work with diversity for instance. Be prepared, and remember they have an agenda. Their goal is to hold you back, to hold progress back. They don’t want you advocating diversity, equal rights or gay marriage because they hate it. The will say “I’m never gonna buy your products again” or “I’ll unsuscribe” or “I’m leaving this organization”. That doesn’t mean you should always listen to those threats from anonymous accounts, since there might not be anything behind it. It might just be an anonymous account who was never subscribing, buying or a member of your organization. And, if they were, but your goal was to change direction then you’re still on the right path. It might be a loose some win more-situation. If you want to know if they’re trolling or expressing real concern there are ways to find out and they depend on situation. These are some (not all) of them. Note, depends on situation. If you’ve REALLY messed up they might not apply. Language. When people criticize because they want change for the better they don’t just post a bunch of swear words and rude remarks. They explain. They say they find something wrong/bad, explain why and how it could’ve been done better. My experience is that trolls more often protest _against_ something (often progress or change) and for exclusion of some, like minorities. But the best way to find out if it is a serious concern or just a hate storm is to change the channel! If someone is posting on your company facebook page: Ask them to email or ask if you can call them. 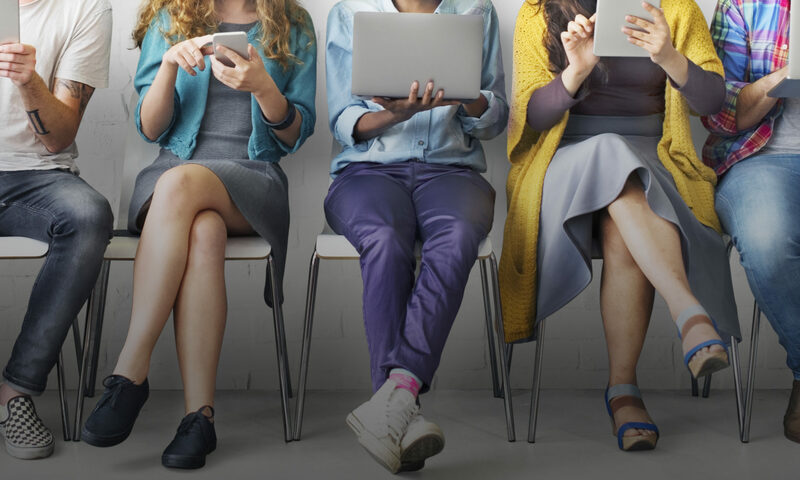 People tend to email or take a call if they are serious. And if they are serious they tend to give you info like their real name, number etc. So some trolls might email. But look for tell tale signs like no full name, fake email account, no records of person in your database. (Fake emails and also fake users tend to love lot’s of numbers for some reason so it would be name1234@obscuremailclient.com) Think of the fake email thing like this: I use the same mail for complaints as the one I send work emails, or job applications with. Trolls will not. Changing channel can also help changing the tone of the conversation. Talking to a person tends to make people less rude. For organizations the most important thing is rules! Have rules, and enforce them. At one job we had a no swearing policy. This was ofc a deliberate tactic. If you can’t swear it makes it more difficult to post angry rude posts. The rules are up to you, just draw a line where you feel it’s appropriate for you. Then decide on the consequences of breaking the rules. Instant blocking? Deleting post? Warning? Two warnings? Decide on a routine and stick to it! And post those rules! Post them on your website. Post them on your social media. Pin a post on your social media page etc. Have in mind, a social media storm might be a storm in a water glass. If you’re used to 10 notifications a day and suddenly get 100 in one hour that might feel like a huge increase. But it doesn’t mean it’s a huge problem. It might be one group targeting you with 10 posts each from 10 anonymous accounts each. Always think of proportions. Count percentage of posts in comparision to your followers, members, voters or subscribers. If you have 100 000 followers, 100 notifications isn’t really all that much in the grand scheme of things. Also, storms in water glasses pass quickly. People get tired of it real soon. Look at it in the long run. Dare to chill on social media. I know, it is a fast instant reply, quick updates kind of medium. But look at the time cycle for your organization. That’s what matters. The member increase or decrease in one week or one day doesn’t always paint the whole picture. Things might be turbulent in the short run but have a much more positive effect in the long run. Don’t focus too much on follower counts. But let’s say you know all this and you know this is an extremist group targeting you. What do you do? Well you know what I’m gonna say: Go ahead delete and/or block. Yes organisations are allowed to block. I’ve worked in the public sector and even there we were allowed to block. It was ok within the Swedish law (yes I asked lawyers). “But if I’m someone is blocked aren’t we violating their freedom of speech?” Don’t worry they’re still posting, you didn’t take that away. “But what about the fact that they can’t see our posts!” Oh but they can, they just have to log off or switch to another web browser. Or use the app for their posts and the browser on their phone for reading. Or use that other non trolling account that’s not anonymous. So no, they are not even blocked off from your company social media page. And you haven’t cut off their way to contact you. Surely you have telephone number, email address, website or other social media? This means they can still read whatever they like, post whatever they like. And they can still contact you. The only thing that actually happens is that your social media account, which they are out to bother or harass, doesn’t get notified of it. The freeze peach is therefore intact. Like I said: Freedom of speech does not equal compulsion to listen. The right to express opinion doesn’t make it mandatory to read it. Nätaktivisternas bok Ta nätet på allvar – antirasistiskt engagemang mot hot och hat på nätet, som jag har författat en stor del av, har släppts! Boken vänder sig främst till personer som arbetar med unga och vill bli bättre på att främja engagemang samt motarbeta hot och hat på nätet. 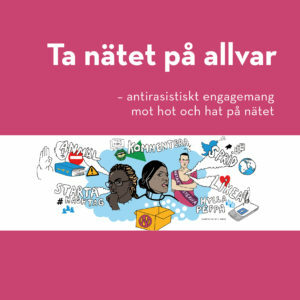 Med fakta, tips och unga nätaktivisters berättelser ger boken svar på frågor om antirasistisk nätaktivism, hur man kan arbeta förebyggande mot hot och hat samt vilka lagar som gäller på nätet. Jag har skrivit om ungas nätvardag, vilka som är nätaktivister och nätaktivisters behov av närvarande vuxna. Jag har även skrivit om att bygga upp ett säkerhetsarbete, med fem tips inför arbetet med en säkerhetspolicy. Här kan du läsa boken online. Den finns även som nedladdningsbar PDF. Jag har skrivit en text till Kurage, en idétidskrift för ideella organisationer, om hur man kan skydda sig från hat på nätet. När Nätaktivisterna startade började vi undersöka hur andra organisationer arbetade för att hantera hot och hat. Det märktes dock rätt snabbt att få hade några rutiner och att ännu färre hade strategier för hur de hanterade hot och hat på nätet. Vi som jobbar antirasistiskt måste ha en strategi för att bemöta det hat och hot som uppstår, skriver Vian Tahir, kommunikationsansvarig på Nätaktivisterna. Läs hela texten här. Jag har blivit intervjuad till boken från snack till verkstad som riktar strålkastarljuset mot de praktiskt arbetande antirasisterna. De är aktivister, privatpersoner, ideella organisationer och företag, och de gör allt från att hindra nazister att få fäste på orten till att skapa lönsamhet genom smartare normer. De drivs av olika värderingar och verkar på olika arenor, men de har en sak gemensam: de bidrar till ett Sverige med större mångfald och mindre rasism. Den finns att beställa här. Vian Tahir vill få gymnasieelever att jobba antirasistiskt på nätet. Polisanmäl allt som är hets mot folkgrupp, uppmanar hon. Läs intervjun i sin helhet här. Tillsammans med Johnny Lindqvist från Statens Medieråd pratar jag i Skolverkets podd på temat Hat på nätet – hur tar vi upp det i skolan? Skolpersonalen får reda på att några elever på skolan blivit utsatta för trakasserier på Instagram och Facebook. I flera fall handlar det om att eleverna blivit utsatta för rasistiska och främlingsfientliga påhopp. Nätaktivisterna är en av de organisationer som tar upp kampen mot hat och hot på sociala medier. För att Facebook ska följa sina egna regler krävs ofta massanmälningar. Läs intervjun i sin helhet här. Förra året intervjuades jag för en bok om hot och hat på nätet. Nu är den här! 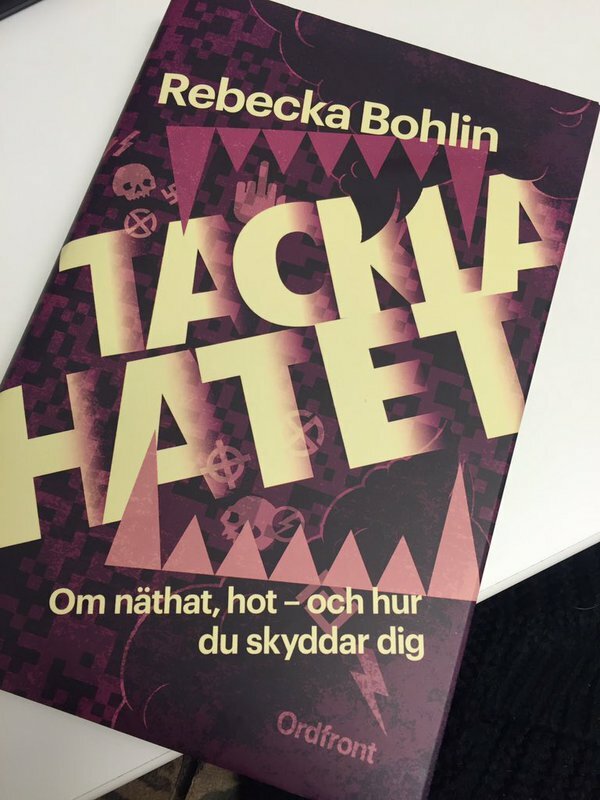 Tackla hatet : om näthat, hot – och hur du skyddar dig av Rebecka Bohlin. Storhatarna på nätet är få, men inte ofarliga. Tvärtom. Om de får hållas kan demokratin vara hotad. Normerna i samhälle har de redan ruckat på. Läs intervjun i sin helhet här.